There were a lot of games to see during last week's E3; some of them co-op, others not so much. Amidst all the announcements, demos, and chaos, though, there was one co-op title that Nick and I were eager to get our hands on and try out - inXile's upcoming co-op action/adventure/puzzle title, Hunted: The Demon's Forge. 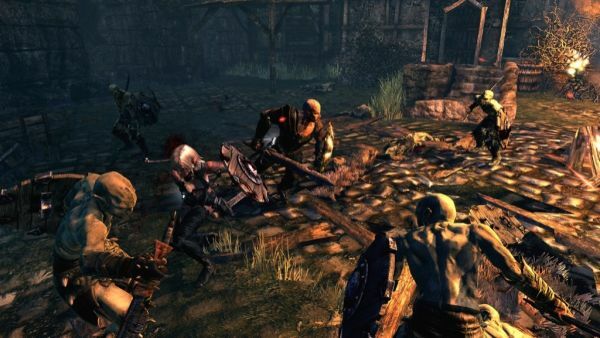 Initial previews of the game likened it to "Gears of Warcraft" or "Spears of War," and those wouldn't be too far off, but the game certainly seems to promise more. In Bethesda's booth on the E3 show floor, Nick and I headed to a corner of the that was dedicated solely to demoing Hunted, complete with a fantasy feeling cave setting and giant statues of the game's heroes, Caddoc and E'lara. Not wasting any time, we jumped into the action. After a brief introduction to the controls, which were very akin to Gears of War right down to the "roadie run," and a little scene between Caddoc and E'lara, who seem to have a dynamic that reminded me of the interactions between the characters in Trine, we were tossed into combat against a group of skeletons. I was playing as the melee happy Caddoc while Nick was in control of E'lara. While Nick stuck to cover and fired arrow after arrow into our foes, I took the fight up close and personal. Of course, neither of us was completely locked into our roles. Caddoc has a crossbow that he can use (though not nearly at the same proficiency as E'lara) and E'lara does have a sword and shield with which she can defend herself if she's ever surrounded and your partner is busy with problems of his or her own. If that's not enough, though, you and your co-op buddy can switch who controls who at certain points in the game, allowing each player to experience the story from both perspectives. While the melee combat felt like it could use a little more tweaking, Hunted: The Demon's Forge offers a little more than just the sword and shield/bow and arrow. Both players have certain abilities they can use with their preferred weapon of choice, and spells that may be used either offensively or defensively. Caddoc's abilities include things like a shield bash and the ability to levitate all nearby foes, thereby making them easier for E'lara to pick off. E'lara had the choice between normal arrows and ice arrows, which would freeze enemies and make them easier for Caddoc to take down. These certainly aren't all of the abilities the two will have be able to use. 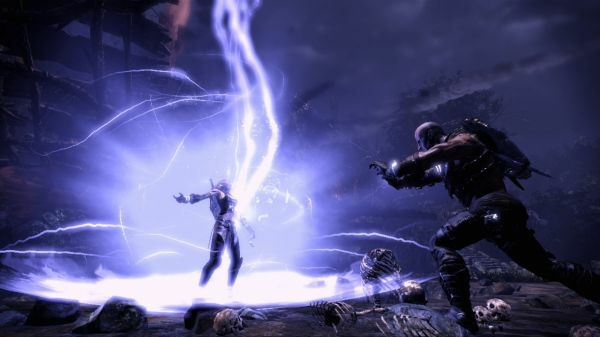 A trailer shown after the demo hinted at more abilities beyond these, such as fire arrows for E'lara that light dark areas and more. The spells that our two heroes may cast can be directed at their enemies to cause destruction, or towards one another to boost their offensive capabilities for a brief period of time. 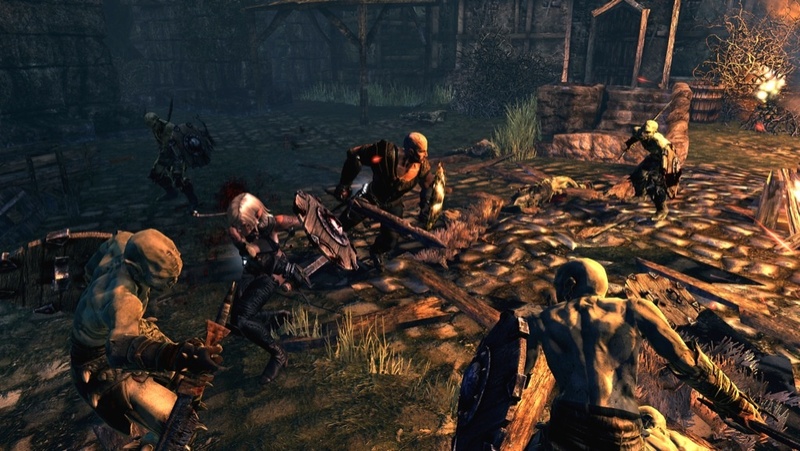 From a combat perspective, then, Hunted: The Demon's Forge certainly has all of the makings for a solid co-op experience. The best example of this came towards the end of the demo when Nick and I found ourselves in a kind of arena with a good deal of foes charging at us. While Nick took command of an automated bolt turret to shoot down some heavy cables that were keeping a gate in-place and blocking our way forward, I held off the foes and kept him safe from harm. For an added to degree of fun, I occasionally used Caddoc's floating ability to set up a couple of skeletons to get skewered by Nick's heavy bolts. Watching skeletons get knocked out the air and smashed into pieces by giant flying bolts is certainly a sight I haven't seen before, but one I definitely want to repeat. Cooperative combat isn't the only thing Hunted: The Demon's Forge has to offer, though. After clearing out one room of baddies, Nick and I came across one of the DeathStones that are part of the story and also provide Caddoc and E'lara with clues about what to do next, as well as setting forth the optional puzzles for our heroes to solve. Unfortunately, we weren't able to make out the riddle that was laid before us, but the demo was set up to give players the rewards more-or-less automatically. A couple of rooms further along, we came across a wicked looking axe for Caddoc that one of the developers at the booth told us was the reward for successfully completing the puzzle. Weapons for Caddoc and E'lara aren't the only rewards to be had for solving the puzzles, but the developer wasn't saying anything more about what bonuses they were planning on offering. While it's a shame we couldn't actually try our hands at figuring the puzzle out, playing around with some of Caddoc's and E'lara's abilities gave us some idea of the kinds of mind-benders they may face along their journey. Based on what inXile and Bethesda have put together so far, Hunted: The Demon's Forge is certainly shaping up to be a pretty solid co-op title. With the game set to be released first quarter 2011, there's plenty of time to polish up the rough spots and really make this a quality title to help ring in another new good year of co-op gaming. Page created in 0.5135 seconds.